Acts of Kindness - Non-profit organization to offer help to those in need. Just a little kindness goes a long way. Having AOK sponsor us enables us to request donations from businesses & large corporations... the larger companies require a 501c3 charitable status, so AOK has been a HUGE help to us. For instance, Frito and Pepsi donate food & beverage for the beach - I-Party donates paper goods & raffle items for our pasta dinner - A.C. Moore has donated gift baskets, to name a few. What is Surfers Healing RI? 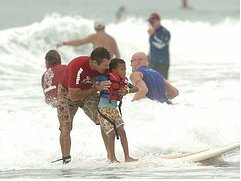 Surfers Healing is a free surf camp for children with autism (although they do not turn away over 18). Surfers Healing is based in California and they run the camps up and down the East and West coasts. The surfers (from California, Puerto Rico, Hawaii) volunteer their time and the funds raised in RI pay for travel expense for the surfers, equipment, fees (insurance, beach permits, etc). The day camp is free for the children and their families. They get a surf lesson and ride the boards with a surfer holding them. They stay out for about ½ hour each. Food & beverage is also provided for the families. In 2012, there were over 160 children registered for the day.